Jim Serrett Studio: Thanks for listening. Here we are at the end of another year, and I wanted to thank everyone for their support and interest. Many of you took the time to leave some thoughtful and challenging comments on my work; I can not tell you how much it is appreciated. If I did not respond directly to your comment I assure you that my lack of response was either circumstances or procrastination. Which ever case, be assured I value each and every comment, again my sincerest gratitude. The goal with my blogs (Studio and Pochade) has been pretty simple. To attempt to publish at least one article on each site per month, with some type of content that may be of interest to artists or art patrons. I make no claims to great expertise but do profess a great desire to learn as much as I can about the nature and language of my craft, painting. And I know the most important pieces of information I have been given have come directly from conversations and exchanges with other artists that are kind and generous enough to share their skills and knowledge. I hope I can share the creative wealth and pass along, in some small way those gifts. And thankYOU, Jim: your blog is interesting, and your work is wonderful. Love the photo you used for this post....what on earth IS that??? I am surprised you don’t recognize the early version of the iPod. 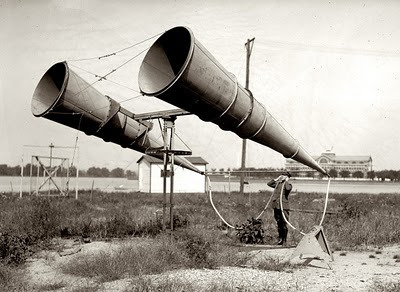 It is two giant horns with ear tubes, evidently designed to listen for approaching aircraft during World War I. The photo is from a image bank, credited to the National Photo Co., titled, “Bolling Field Amplifiers, 1921”. What a great blog you have, I love the photograph from this post! :) made me smile.